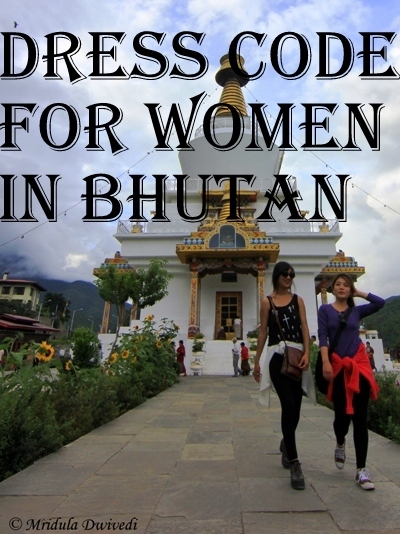 As Bhutan is our neighbor I was not too worried about the dress code for women before I went! Looking at the temperatures in July I knew I would need to wrap up. So I packed accordingly. Now that it has been some time since my visit I try to construct the dress code for women in Bhutan through pictures. I saw a lot of women (men as well) in Bhutan wearing their traditional dress. It looked pretty, demure and classy! While walking through the souvenir shops of Thimphu, I asked this lady if I could click her picture. She agreed quite easily. The Bhutanese national dress for women is called Kira. I am not sure if this is Kira or a variation of it, but it looks so pretty. 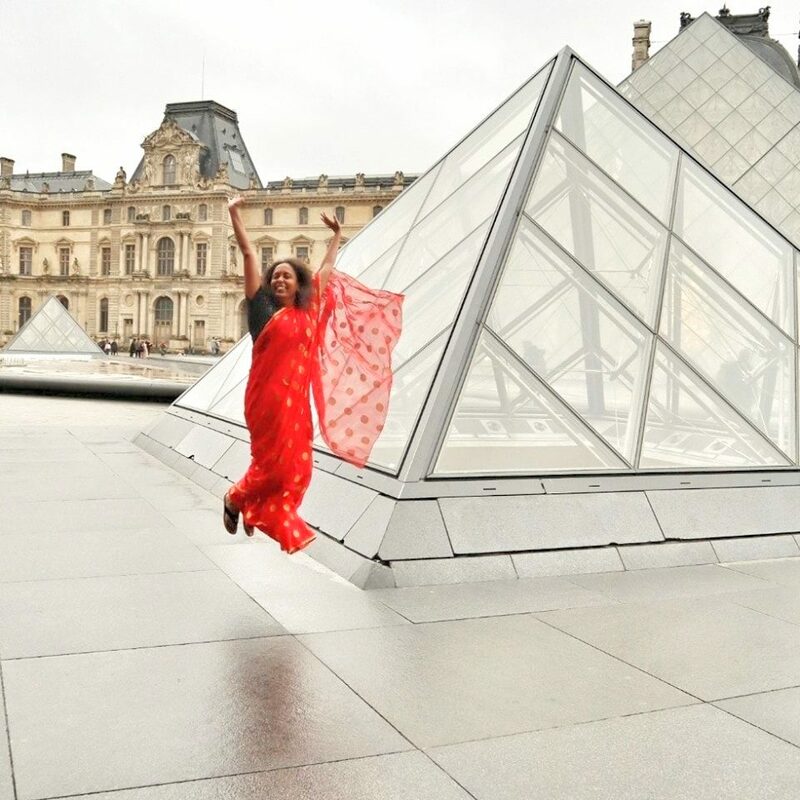 It is quite common to see women in modern attire as well. Jeans and capris were quite common, some would wear shorts too. But in the same picture, in the left hand corner you can see women in their traditional attire as well! The younger generation usually dresses in a trendy way, like anywhere else in the world! 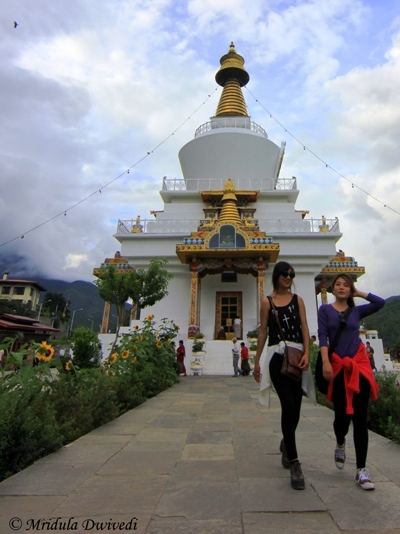 I met the girls at the Buddha Point at Thimphu as well. They were shooting for a tourism catalog. The weather is such that it is sensible to have a warp, you never know when you would find it cold. The was a dress code at the religious places. At the Phunaka Dzong you are not allowed to wear a sleeveless top. I was wearing one, but as I was carrying a full sleeves jacket, I just wore it over my top. 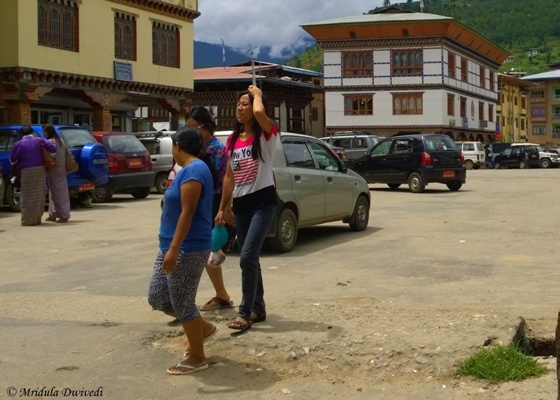 What the lady in the picture is wearing is fine, even a short sleeve will do at the Dzongs. But carrying a warp or a full sleeve jacket is such a wonderful idea, it keeps the cold away and it can come in handy to meet any such dress code requirements! Here is a full picture of the traditional Bhutanese dress, Kira. For a while I was tempted to buy one for myself but I knew I would hardly ever wear it, and shopping in Bhutan is not cheap at all. In conclusion, to me western dresses looked fine, women commonly wore jeans and shirt. Sleeveless was fine as long as you were not visiting a religious place! I also feel that women do cover up a bit more than what may be the norm in the western world. I did not see too many low necks or short skirts or skimpy shorts. PS. 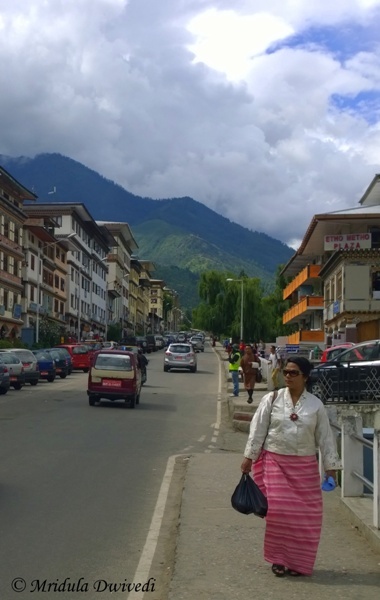 I was invited to visit Bhutan by Makemytrip. Kiras are pretty expensive in Bhutan.I remember I too hopped in a few shops because they look so elegant,but couldn’t buy cauz I thought it wasn’t worth spending so much! There dressing is similar to Garo and Khasi tribes of India. Didn’t know it was called Kira. Wonderful post. You are right, I saw this in Shillong too and it looked beautiful.